One of Bootie Mashup’s favorite producers, Titus Jones, has just released an epic collection of mini mashups, all put together into a tight package called the Mashup Power Hour. 206 songs. 159 artists. 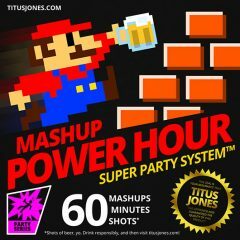 60 mashups. 60 minutes. 60 shots. Yes, he’s even turned the whole thing into a drinking game if you want! Every time you hear the coin, a new mashup begins and everyone takes a shot of beer. Mashups are a mix of pop, rock, rap, EDM, and more from the ’80s, ’90s, 2000s, and 2010s. Immediately upon release, he asked for listeners to vote on their favorite tracks, with the promise that he would turn the ones with the most votes into full-length mashups that would appear on his upcoming album, to be released next month!